We all know Shawn Michaels. Top 3 wrestler of all time (where he is on your list another article for another day). These are the most important matches of his career. (Note that these are considered not just from the action in the ring, but the significance and importance of each bout is taken into consideration). We've had a top 5 before, but this is a different one than that. 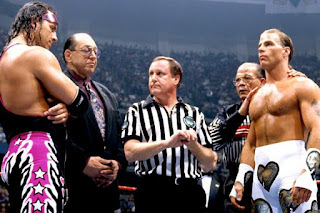 -This match is one of the most important matches in the great career of Shawn Michaels. It was his first match back since his career ending back injury. Shawn went with a guy he trusted and his best friend HHH who was ascending to the top of his game (no pun intended). They've had better matches against each other, but this is probably their most important because it not only began a fierce rivalry, it revived a career that we all once thought was dead. -This match was a huge deal for BOTH men. Shawn was wrestling in his first singles main event at WrestleMania since WrestleMania 14 and he was going against a somewhat still raw but very talented John Cena. Although at the prior WrestleMania he had wrestled a legend in HHH, Cena needed to prove he could hang with another legend. Shawn was unexpectedly thrusted into this situation with the injury to HHH, but Shawn delivered here. Both men benefited from this match. -This may be the best match on this list as far as pure wrestling goes. This was Shawn’s first WrestleMania match since returning, and needless to say he was nervous and still getting used to being a full time performer again. While Jericho had already had a pretty decorated career up to this point, he NEEDED this match for validation and boy did he get it. This match stole the show in what arguably was the greatest WrestleMania card ever (another debate for another day) and Shawn proved he could still bring it when the lights are at their brightest. -This match was big. Not just for the wrestlers involved, but for WWE as well. WWE had to get past the Hulk Hogan era as well as recover rom a lackluster 1995. This match showed that you don't need size strength and a massive look to put on a good show. This match deviated from the norm of the superhero sized men and focused more on wrestling (similar to Punk Vs Daniel Bryan in the future and many of the guys we see main eventing today). This match not only set the standard, but put down the groundwork for the many things we see today. Two workhorses going at it for the top prize. What's not to love? -This might be the greatest match of all time. It's the best match I've ever seen. Two titans with very different career paths going at it on the stage they both are known for, WrestleMania. This very well should've been the main event for WrestleMania 25, but that's neither here nor there. With so many near falls and the narrative that Undertaker has never beaten Shawn Michaels added to it and made it that much better. It wasn't your normal big man vs small man match because Shawn made Undertaker look very vulnerable during this match. You can watch this match over and over and never be tired of it. These are matches that truly shaped Shawn at different points at his career. The only matches that are missing here would be the Ladder Match at Wrestlemania 10, and perhaps the match at Wrestlemania 22 with Vince since it led to the DX return. If you have any other choices, feel free to post them below.